The Old Town of Galle and its Fortifications ".. is the best example of a fortified city built by Europeans in South and South-East Asia, illustrating the interaction of European architecture and South Asian traditions." European building materials were replaced by those more convenient in Asia, but the town still looks very much European from the outside. Galle was first colonized by the Portuguese. In the early 17th century, the Dutch took over. They established the still existing fortress and ramparts. Also, the Dutch designed the look of the town. The Dutch connection makes Galle an interesting place to visit (for me, as I am Dutch myself). 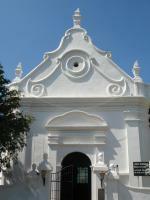 Especially the church (Groote Kerk) and some of the little streets looked very familiar. Hire a bike, and you feel like you are in Holland. The new part of Galle is hell, but the old town I found quite charming (though very small). There's a really pleasant atmosphere in the streets of the old town of Galle. The architecture has that really interesting mix of European colonialism and South Asia. What I liked was that, although there are quite a few hotels and restaurants, not all of the Old Town felt touristy. There are still quite a few people living here and it has an authentic community. There are great views along the coastline and it's worth walking the old fortifications to see that side of things. If the list of world heritage site is Sri Lanka national history book, it will definitely start with Anuradhapura as the starting point of Sinhalese culture and end with Galle as the starting point of colonial period. Galle is a unique cultural world heritage site as it is not related to Sinhalese culture or Buddhism at all; visiting Galle is truly another chapter of Sri Lanka history. Galle is located in the small peninsular and surrounded by the mighty fortifications system built by Portuguese and developed by Dutch. 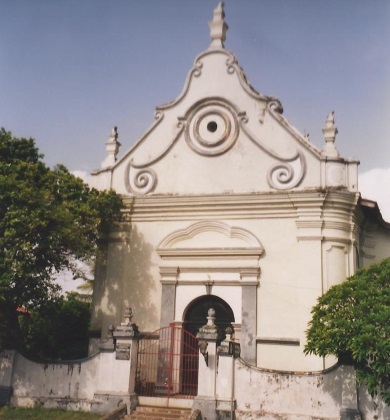 Galle was the important port of call that was a part of spice maritime route; as the result, Gall has unique atmosphere of cultural exchange of local people, Muslim, Dutch and British. At present, Galle has been regarded as one of best preserved colonial cities in South Asia. During my visit, there was a large construction of new road surface, so Galle I saw was a big construction site with many pile of rock and sand for concrete road; however these were unable to destroy the charm of Galle. People are extremely friendly and each alley has its own characteristic, really similar with mosque area of George Town, Penang. 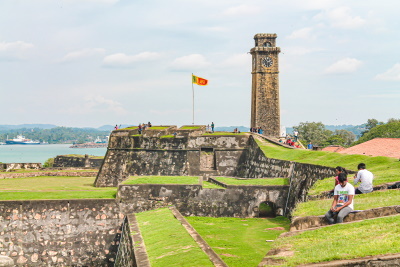 The main attraction of Galle is the fort, the grandest is the northern part with comprise of three bastions, star, sun and moon, a real engineering wonder; however, the southern part is my favorite with extremely beautiful view of amazing Indian Ocean, lighthouse and lovely mosque. The city center around Dutch church is also nice with unique Holland atmosphere. Galle is an easy and nice place to enjoy, this is not a must place to visit in my opinion, but visiting Galle is the complete historical lesson from colonial era to contemporary tsunami tragedy of this beautiful country, Sri Lanka, so why not visit this town is maybe the hardest question to answer. Galle Fort is a beautiful place, but is, of course, almost overwhelmed by the horrors of the Asian Tsunami. So many people there must have lost everything. If you are in Sri Lanka you should undoubtedly visit this place. We have just visited post-Tsunami Galle (Mar 2005). If you are in Sri Lanka you should DEFINITELY try to go there - both because the locals need tourists and because the old town is as delightful as ever. As far as we could make out the majority of the old town escaped the direct effect of the Tsunami (it is both protected by the ramparts and partially built on a rise) and the guest houses and restaurants are fully working. Unfortunately the same cannot be said of the area outside the walls. Grass is growing on the cricket ground again and the railway and bus services are working but many of the structures facing the sea are destroyed. The NGOs seem to have done (and are still doing) a wonderful job - but the same cannot be said for the Sri Lankan government - which seems paralysed by corruption, incompetence, lack of skills, inertia, bureaucracy and political infighting. Its suggested rule that no building can take place within 100 metres of the shore line (possibly including surviving buildings) is causing despondency and confusion among locals whose little piece of land is their only hope of a livelihood - suspicion abounds that such "forbidden areas" will find their way into the hands of big developers (politically connected of course!). Schools are not yet properly working and we heard of families whose children are unable to register anywhere (eg in other areas where they have relatives) because their papers have all been washed away. The army is noticeable by its absence when it should surely be building wooden structures to get people out of the tents which will not be suitable for the upcoming monsoon. The government has complained that it hasn’t seen any of the money promised by Western governments – but this is because it has been tardy in coming forward with properly thought through projects. Even the locals expect a large part of any monies reaching Sri Lanka through the government to “disappear”. It is hardly surprising that the government newspapers adopt a negative stance towards the NGOs, accusing them of overlapping and being uncoordinated – they are showing up the government’s own lack of action and providing a means by which monies can reach the locals without providing an opportunity for “siphoning off” by politicians and officials! 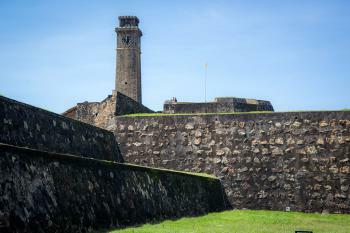 Article from The Island: The old worlds romantic city: GALLE! Thomas Cook Round the World tour 1872-1873: 26 Dec 1872. Spent 3 days instead of 8 planned and had to miss out Kandy and Colombo! "Galle itself was close and the air was damp as a sirocco. We were glad once more to get under way for India". Zheng He: "The Galle Trilingual Inscription was a stone tablet inscription in three languages, Chinese, Tamil and Perisian that was erected in 1411 in Galle Sri Lanka to commemorate the second visit to Sri Lanka by the Chinese admiral Zheng He The text concerns offerings made by him and others to the Buddhist on the Mountain of Sri Lanka. It was found by an engineer, S. H. Thomlin, in 1911 in Galle" (Wiki). Built or owned by British: The British didn't leave the Dutch area untouched during their period of rule. In particular a. "There are two entries into the fort, the Main Gate, built by the British in 1873 which pierces the main ramparts between the Sun and Moon Bastions, and the more venerable Old Gate, further to the east on Baladaksha Maw (or Customs Road). The latter is distinguished by the British coat of arms carved into its outer stone lintel" b. "The northern part of the fort is dominated by the British-built Clock Tower" c. "Further south along Church Street stands the Catholic All Saints Church, built by the British in 1868 and consecrated in 1871"